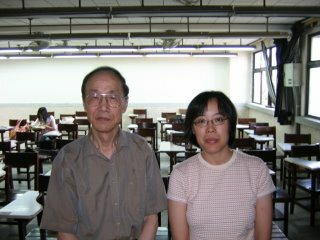 Thanks to my friend Wenyuan who let me know that Prof. Wu was having lessons at Taiwan University every Friday morning. So I attended one on Friday the 13th. The subject was The Investigation of Chinese Rites and Music System -- Tao Si Big Tomb's Te Chime and Tuo Drum 中國禮樂制度探源-- 陶寺大墓特謦(te qin) 鼉鼓(tuo gu) 兼論特磬在中國文明形成中的地位. Prof Wu let us hear the sound of 3 Chimes. I just realized that it is the sound of "gold and stone" 金石之音. I also realized how the sound comes out from a chime and how the ancient people tune the chime sound by rubbing the sides of the stone. 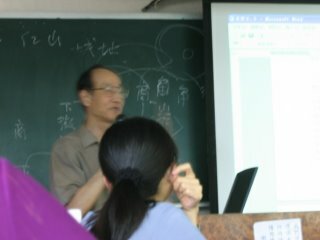 Prof Wu said that China means "many countries in a country" 中國＝國中之國. Shangxi　山西, Henan　河南 and Shanxi　陜西 Provinces were the area where Chinese culture started. The set of Tao Si Big Qins (Chimes) was found in the south of Shangxi Province, Xian Fen area 山西襄汾. It belongs to Longshan culture (2500B.C.～1900B.C.). Tao Si ruin was formed by 5 big tombs (3072, 3073, 3016, 3015 and 3002)and each tomb was build in a different time period. The te qin and tuo gu were found in the 3072 tomb which has different craftsmanship and quality from others. The materials were not sourced locally. They are the most advanced Chimes. Yet no one knows which area they came from. A chime, which can create 2 sounds Do and Mi, is the well developed chime. Usually the earlier developed chimes were more advanced. The later developed chimes fell behind, their sound quality was not clear enough, according to Prof Wu.